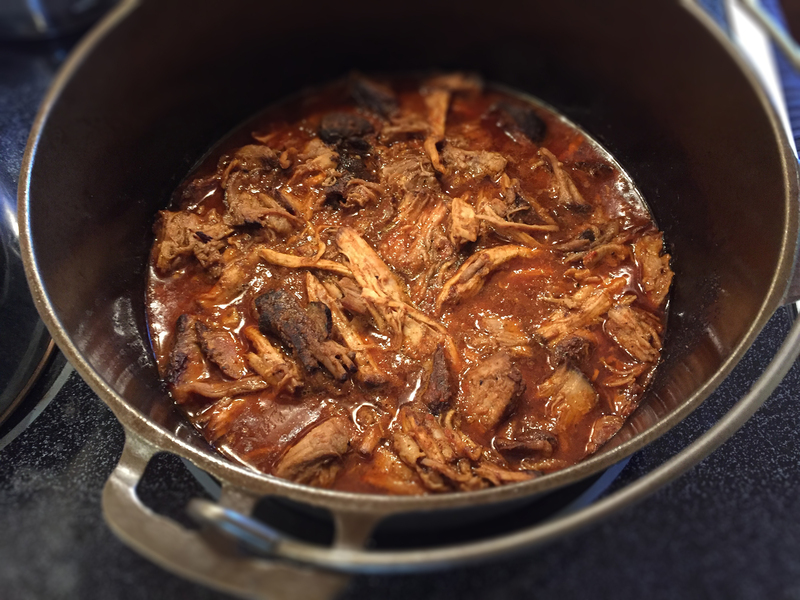 This is a great, carnitas-style Tex-Mex recipe for using leftover pulled pork. Braised slow and low, the meat is super-tender. Adjust the seasoning to your taste. If you still have leftovers, they freeze wonderfully… Enjoy! Place the leftover pulled pork and the ingredients indicated in a 5-quart Dutch oven heated at 250-degrees in your oven. Mix well and heat covered for two hours. Stir once at one hour. After the second hour, check for tenderness. Reduce heat to 170-degrees F., if needed until ready. Serve in toasted tortilla shells with your choice of fresh guacamole, red onion, cilantro, and shredded Mexican cheese. Ensure that there is enough chicken stock and BBQ sauce to just cover the pork. Braise it slow and low until tender. Anything declared “the official BBQ dish of Texas” has to be good. This defines authentic BBQ brisket. And it should come as no surprise that some good things take time to prepare. Lots of time. Lots of time with lots of cold beer. The key to good brisket is selecting a quality cut of meat, and then smoking it at a constant temperature, slow and low over hardwood chips for many hours. You’ll note that many people prefer to baste the surface of the beef with a light coat of yellow mustard before adding the rub. This is called “the glue” by BBQ afficionados, and in theory, helps the dry rub ingredients bind to the meat and keep it moist while smoking. In all honesty, I’ve never noticed a difference in taste, texture or juiciness with or without it. You decide. The night before you plan to smoke the brisket, lay out the meat on a large cutting board and trim the fat cap down to 1/4″. Note the grain of the meat* – you’ll need to use this for determining how to cut it after it’s done smoking (More on that in a bit.) Sprinkle generously with dry rub, ensuring all sides are coated. Pat down with your hands and wrap tightly in plastic wrap. Refrigerate overnight. The next morning, calculate the hours needed for the smoke, including time needed for the stall, or plateau and a 45min-1 hour rest before slicing, using 1.5 hours per pound as a minimum for your guide. 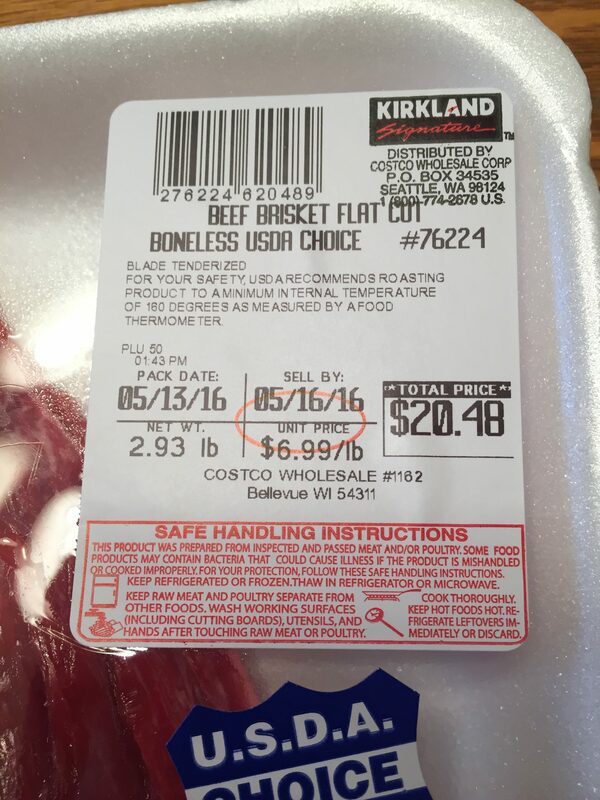 For example: Shown below in the photos is a brisket flat that’s just under 3 pounds. Let’s do the math; 3 x 1.5 = 4.5 hours. Add at least 1 hour for the stall (explainer below), and one hour for the rest before slicing. This particular cut took exactly 6.5 hours, from the time I put it in the preheated smoker, to the time I took it out of the cooler after resting. Now, with that said, you will never know exactly how long the stall is, as this time varies by the weight and structure of the meat — if it has a lot of fat and marbling, it will react differently than a more lean cut of meat. After time, you will know roughly what to expect when planning for the stall. There is nothing more frustrating thinking you’re going to be serving your BBQ masterpiece at 6pm, only to find out it stalled for over two hours at a fixed temperature, throwing off your plans until well after 8pm. At roughly 160-degrees F., meat will hover at a constant temperature before rising again to the proper temperature needed to remove and then let rest. This is called “the stall” and it’s a phenomenon caused by the evaporation of moisture from the meat in the smoker box, effectively cooling the meat for a time, until the temperature-to-water ratio in the box corrects itself. At this point, the temperature will increase again, with the final hour or two increasing more rapidly due to the rendering process of the fat. Remember, the brisket will be done when it’s done, and it may not be a time that you can control. You’ll need to plan ahead for this in your calculation, giving you enough time for the smoke and rest. An hour before you are ready to smoke, preheat your smoker to 225-degrees F. Ensure the ash is cleaned from the wood tray and that the wood tray is properly seated around the heating element. Add about two cups of apple juice to the drip pan and close the smoker door. At this time, remove the brisket from the fridge. Remove the plastic wrap and allow to warm up on your counter. Oil a grill grate with peanut oil on both sides. Place the brisket on the grate and carefully place in the smoker. Insert the digital probe into the thickest part of the meat. Close and lock the door, ensuring it’s tight. That door needs to stay closed and be treated like a Prohibition-era bank vault for the entire smoke! No peeking! Add one cup of wood chips to the chip loader and then start a digital timer. After 45 minutes, reload the wood chips. Add wood again after another 45 minutes. You will not need to load more wood after 135 total minutes as the meat will not absorb more smoke. In case you’re wondering, the magic meat temperature for this cutoff is about 140-degrees F.
Your target temp for removing the meat from the smoker is 195-197-degrees F. As discussed above, at about 160 the meat will hit the stall and hover there for at least 45 minutes to several hours. At about 170-degrees it will start climbing. Check the internal meat probe temperature often after this point as it will continue to rise more quickly. Remove the brisket from the smoker when it hits your target internal temperature of 195-197. Working quickly, remove the probe and wrap tightly in heavy aluminum foil. Place the meat in the bottom of an empty beer cooler. Layer towels over the top of the meat (this acts as an insulator) and seal covered for 45-minutes to 1 hour. Remove and slice carefully, perpendicular to the grain* in 3/8″ planks. Serve immediately with your favorite BBQ sauce on the side, potatoes, beans, roast corn, or just about any other Southern dish you can think of. Brisket plays nice with everything. Enjoy!! 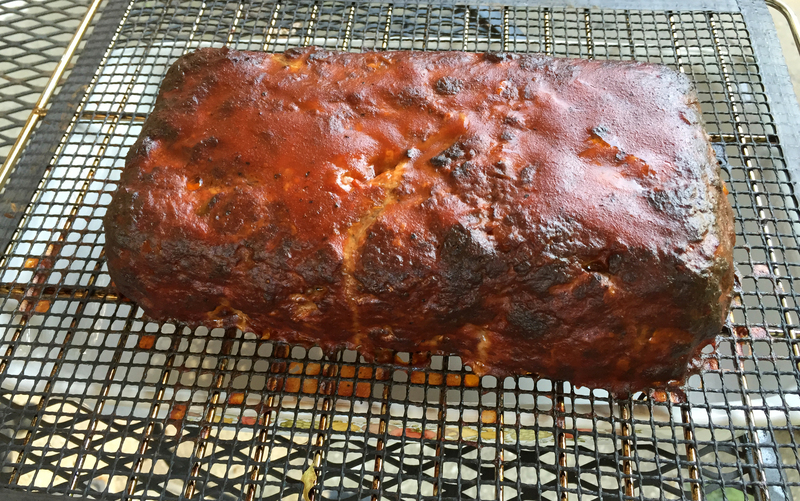 This is a recipe from Jim Fanto, by way of Masterbuilt’s Facebook Group (My Masterbuilt Electric Smoker.) Jim hails from Texas and is a retired Army Airborne Ranger. He was nice enough to share his secret BBQ brisket rub recipe with group members. 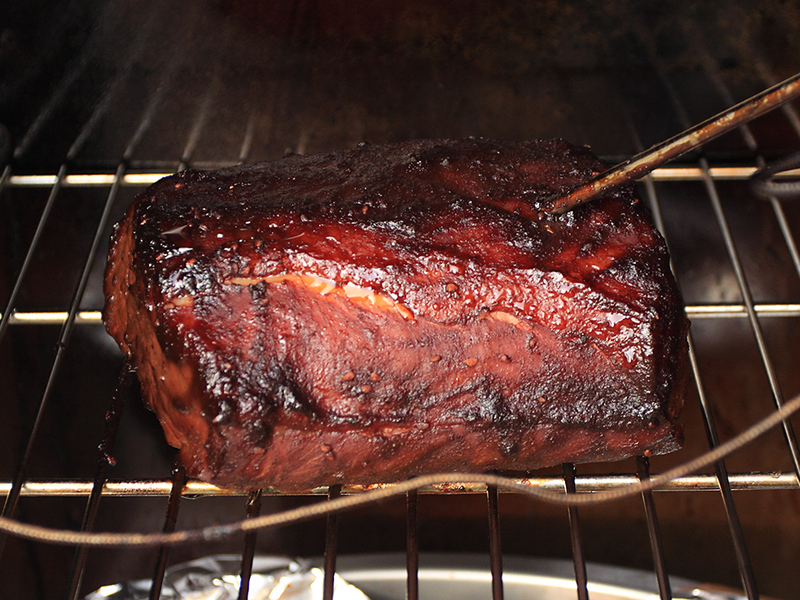 If you have a Masterbuilt smoker, join the group, try his recipe and give him a big shout-out. And while you’re at it, join me in thanking America’s Armed Services Veterans for their bravery and dedication. 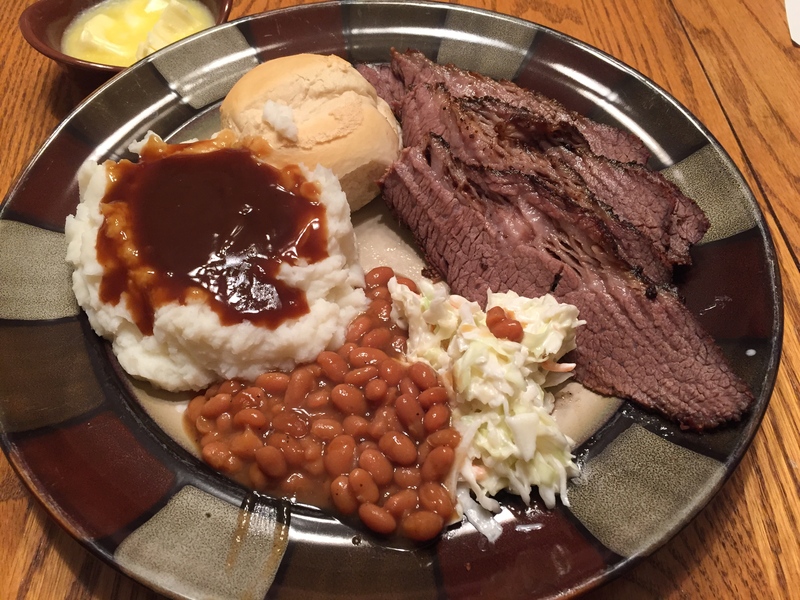 Click here for my BBQ Beef Brisket recipe. Measure ingredients and add to an 8-oz. shaker jar. Mix well. 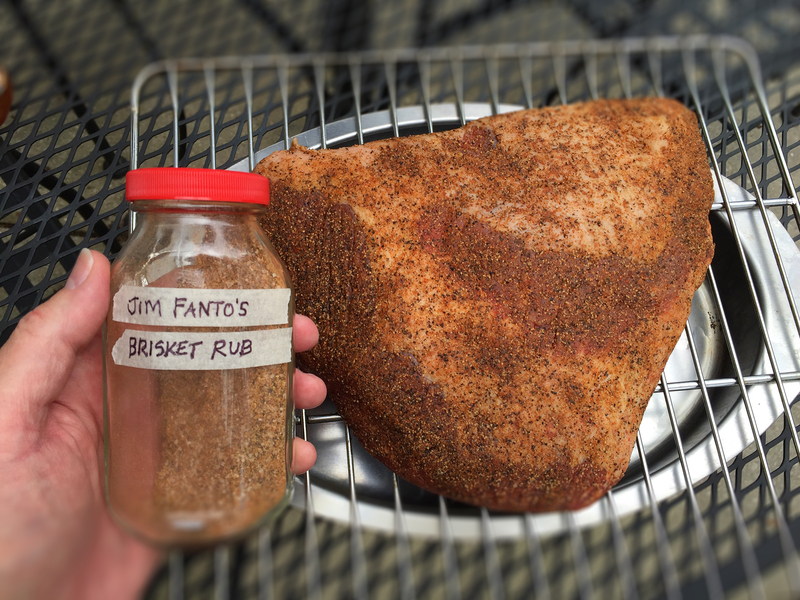 Sprinkle liberally on all sides of the brisket. 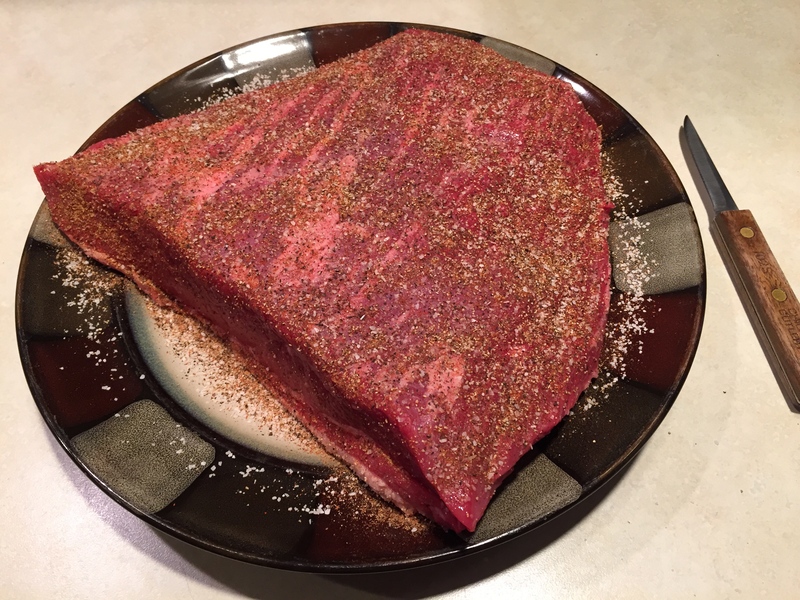 Pat down, wrap tightly in plastic and allow the brisket to set up overnight in your fridge before smoking. The rub will keep for at least a year in a cool, dry storage cabinet. *Adjust the garlic powder, onion powder and cayenne to your taste. Here’s a Southwest salsa recipe with a unique twist – the tomatoes, peppers, garlic and onion are smoked over wood chips for two hours. The result adds an entirely new dimension to a traditional red salsa. If you have access to an electric smoker, you’ll have better results with more control, due to the built-in thermostat — but using a traditional covered grill with offset heat is just fine. The final product will be reduced by about half, due to the water content rendering out during the smoking process. 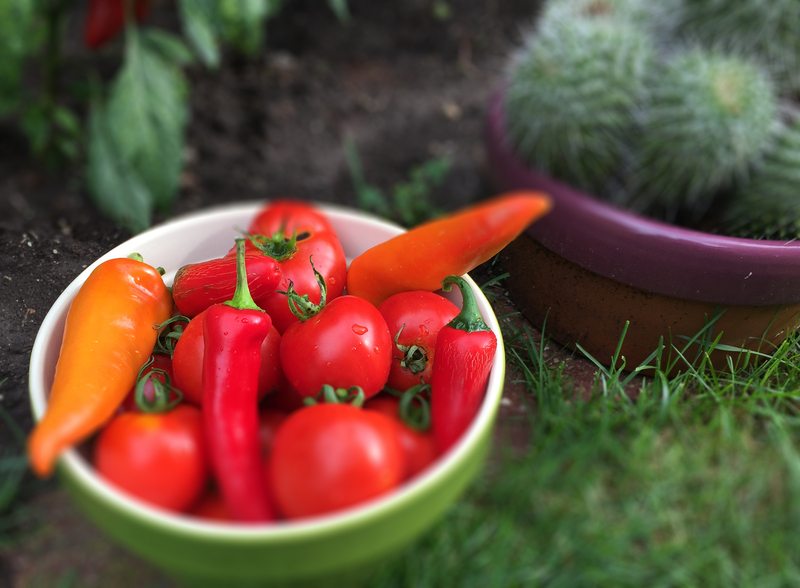 Roma tomatoes are preferred because they have, on average, the lowest percentage of water. The garlic and onion will mellow to a wonderful, earthy flavor. You can use any hard or fruit wood – I’ve found that hickory or applewood works best. If using mesquite, use reservation as it can quickly turn bitter. Enjoy! Carefully wash the tomatoes and peppers and prepare with a sharp knife. Add to a large mixing bowl with the onion and garlic. Add the olive oil and toss lightly to coat. Prepare an outdoor electric smoker by preheating it to 275-degrees F. Place the water pan in the bottom, but leave it empty. You can line it with foil for easy cleanup. Seal the door. 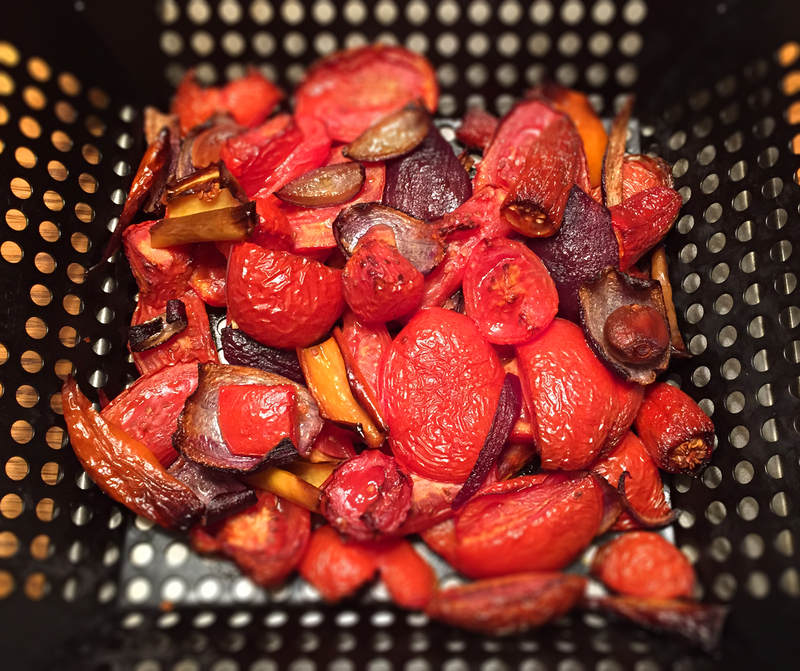 When preheated, place the mixed tomatoes, peppers, onion and garlic in a perforated grill pan directly on a center rack above the water pan. Seal the door and add one cup of wood chips to the chip loader. Smoke for two hours, replenishing the chip loader ONCE after 45 minutes. Do not over smoke. When finished, turn off the unit and remove the contents from the perforated grill pan and place in a food processor. You’ll need to work in batches. Pulse until the desired consistency is achieved. Add the cilantro and pulse again. Transfer to serving bowl and salt to your preference. Add the lemon juice. Mix well, let stand for 20 minutes and serve with blue corn tortilla chips. The ingredients shown after the second hour. For this recipe, I used Jack Daniels’ Whiskey Barrel smoker chips. 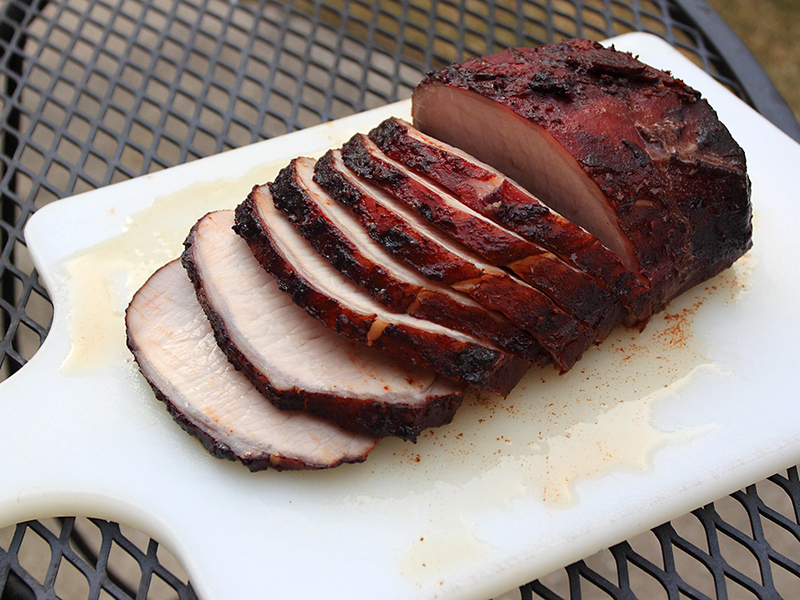 Apple-smoked blackberry-bourbon pork loin — sliced and super-juicy. This is a recipe loosely based on a New York Times article given to me by a friend. 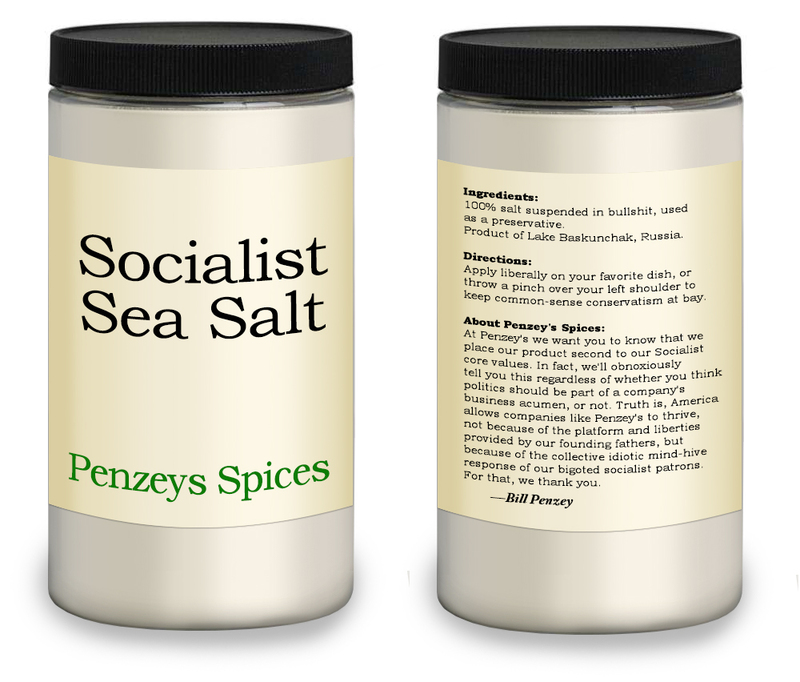 I have heavily modified it to complement ingredients readily available in most kitchens. You can also smoke this on a standard charcoal grill – ensure that you control the heat so it maintains an even smoke — any higher than 225°F and you risk overcooking the loin. The glaze is stunning — a combination of sweetness, slight heat and acidity brought out by the blackberries, bourbon, chipotle, lemon juice and balsamic vinegar. Place the pork loin in an oblong shallow baking tray and set aside in the fridge. 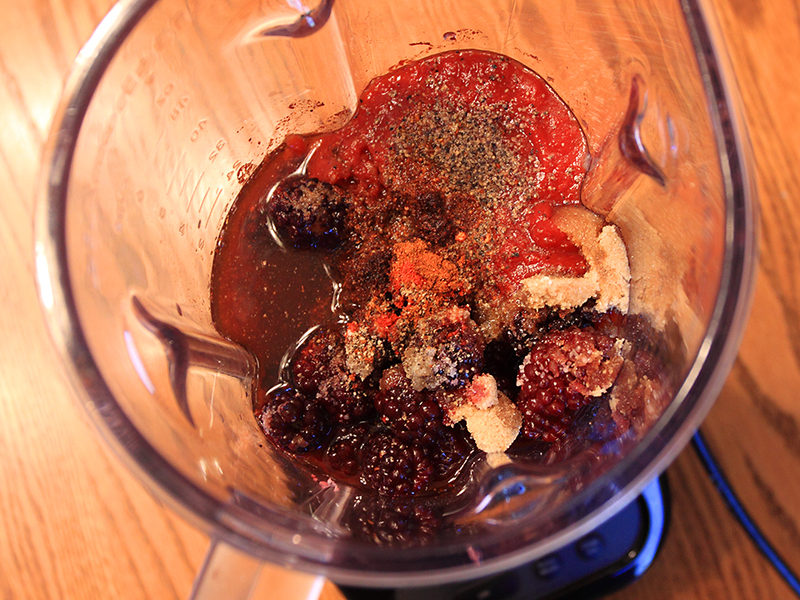 Place the glaze ingredients in a blender and pulse until smooth. Remove and place in a heavy, non-reactive sauce pan over medium heat. Stir and simmer until sugars are dissolved and the liquid reduced – about 45 minutes. Remove from heat and set aside to cool. Pour the glaze over the pork loin and cover with plastic wrap. Place back in the fridge for at least three hours. 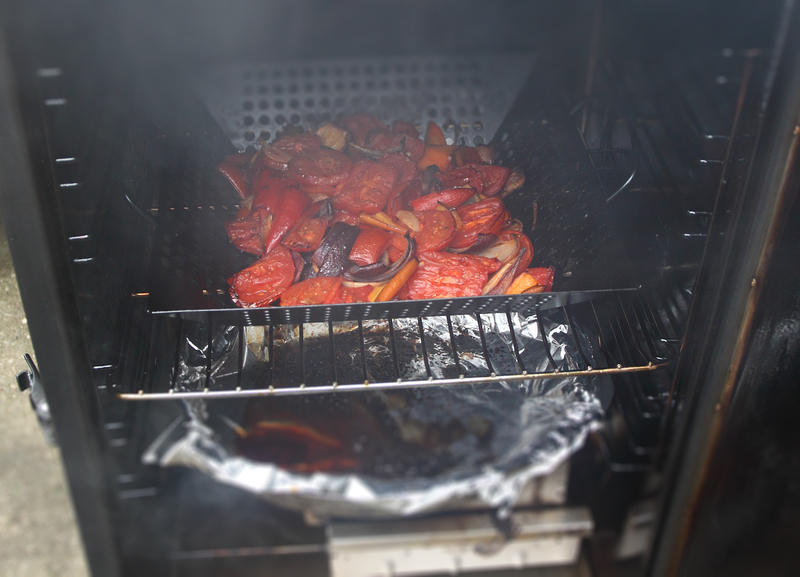 Preheat a smoker at 225° F. Line the drip pan with foil and oil the smoker grate with a bit of non-stick cooking spray. The loin will take roughly 1 hour per pound at the temperature shown. Place the loin on the smoking grate with the fat side up. Close and lock the door and add one cup of apple wood chips the first and second hour. Place the probe in the thickest part of the loin after hour 1. When the internal temperature reads 140°F, remove the loin and let sit in a covered roaster pan for 1/2 hour. The pork loin after 2 hours. Internal temperature is 140°F. Remove and let stand for 1/2 hour, covered, before slicing. Of humble beginnings. The glaze ingredients in a blender. 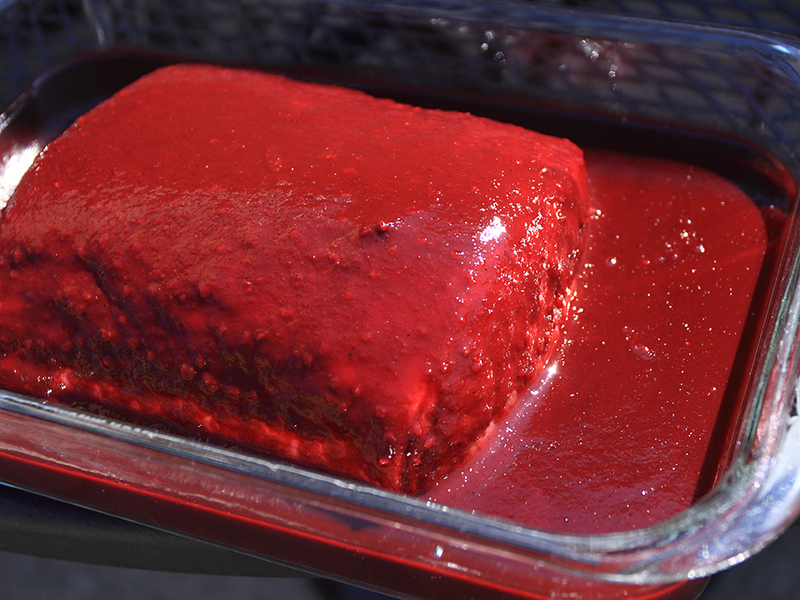 The loin glazed with a blackberry-bourbon brown sugar sauce.